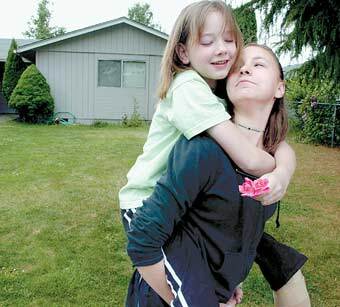 Codi Frazier, 10, rides piggyback Thursday on her sister Loni Nicole Barrett, 13, outside their Keizer home. Codi Frazier will serve as grand marshal of the Relay for Life with her pal, the governor. Codi Frazier has seen Mickey and Minnie, a Globetrotter and a governor. But what the 10-year-old really wants to see is a few more birthdays. Stifling a yawn during a transportation committee meeting at the Capitol, the honorary Madame Chair whispered to a senator on her right, nodded, turned to the audience and adjourned the session with a rap of the gavel. “I was trying to do the best I can because this is my first time being a senator,” said Frazier, a spunky fourth-grader with a personality that won’t quit but a body that will. Frazier has osteosarcoma, an aggressive bone cancer that already claimed part of a leg. Now the cancer has returned. The news was devastating, but it also freed her to live life to the fullest. There’s simply no time for tears and regrets. Three years ago, Codi was living in Nevada with her mom when she was first diagnosed with cancer. The next year, Codi learned to walk using a prosthetic after her leg was amputated above the knee. 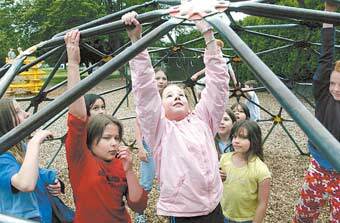 Codi (center) plays with her friends at school during recess. Then tragedy struck again in 2002. Her mom died unexpectedly from an infection. Codi learned to lean on her extended family for love and support. Life started to turn around a bit after she moved to Oregon. But in October, Codi was struck by the first jab of a one-two punch: juvenile diabetes last fall and the cancer’s fierce recurrence this spring. Living life sunnyside up hasn’t been easy, but she has made it look that way. Dr. Stacy Nicholson, one of Codi’s doctors, said childhood cancers are rare, but osteosarcoma is one of the more common tumors of the bone in children and young adults. Recurrence tends to be at the original site or in the lungs. Codi’s cancer, discovered during a routine exam in late March, came back in the lung area in a pattern that makes it inoperable. Her stepaunt, Loni Barrett, who was there during the diagnosis and prognosis, remembered the experience as the hardest thing she ever had to do. Codi cried for two minutes and shifted gears immediately, Loni recalled. “So I can scratch being an 82-year-old grandma off the list?”’ Codi said. Codi’s attitude is a shinning example of the kind of hope that doctors find inspiring. It’s also far more normal in children than adults, who may be hard pressed to summon the personal resources to deal with side effects and the imposition cancer treatment puts on their lives, Nicholson said. “Children are naturally optimists. They live for the present more than adults do,” he said. “I find how children deal with cancer to be inspiring. It helps us help them. Codi was in the early stage of a drug trial for those with inoperable cancers, but has since been released because it wasn’t working. Although she’s already beat the initial prognosis of two to three months, Codi recently developed a cough. “We’re frantically searching for something that may work for her, to reduce the tumor and buy her some more time,” Barrett said. Gov. Ted Kulongoski, who visited with Codi during her day at the Capitol as an honorary state Senator, told her about his own bout with cancer. He recently accepted Codi’s invitation to join her at the Relay for Life. Shortly after the prognosis, Codi latched onto Loni’s suggestion that she focus on living each moment to the fullest. Her list of moments continues to grow. •Honorary state Senator for a day. •Keizer Iris Parade float personality. •Grand Marshall for the 2003 Relay for Life in Marion County. •Honorary Kiwanis and Rotary member. Nine-year-old Teagan stops by on school days, waits for Codi to finish breakfast and walks her to the bus stop. On good days, she’s an ordinary fourth-grader at Cummings Elementary school, albeit one with a slight limp because of the prosthetic. “I can’t do the splits or swim with it on,” she said. Everything else is fair game, including rides on her horse Lacey and piggyback rides around the house. There are twice-a-week visits to Doernbecher Children’s Hospital for treatment and tests, and the thrice daily blood tests and insulin injections. But she considers them a part of her life, like rides on Salem’s Riverfront Carousel, excursions to OMSI and trips to the A.C. Gilbert’s Discovery Village. It was this irrepressible spirit that won Loni’s heart. After spending a summer with her stepaunt in Keizer, Codi fell in love with Oregon and declared that she wasn’t going back to Las Vegas. So her father and stepmom, Darel and Katie Frazier, came up to check out the place. They liked what they saw and decided to move to Salem. As things turn out, their Salem apartment had a mold problem, but they couldn’t afford to move. Codi’s first bout with cancer left them financially strapped. So it made sense for Codi to stay with her stepaunt Loni, who works out of her house and has kids of her own. They have dad and stepmom visit whenever possible. Stepmom Katie Frazier, Loni’s sister, said she’s proud of how well Codi has adjusted to life’s twists and turns. Darel Frazier, who works the graveyard shift as a security guard, doesn’t show a lot of emotion about his only child’s illness. But wife Katie knows that he is heartbroken. Darel said he and Codi like watching TV and movies and hanging out together. “I just take it one day at a time,” he said. The buzz of kids and constant activity at Loni’s house has proven a good distraction for Codi, who was still mourning her own mom’s death. But Codi was too full of life to be sad for long. Instead of withdrawing into her grief and illness, she loves to reach out and help others, Loni said. When Codi saw a 3-year-old girl with leukemia having a wretched experience after chemo treatments, she bought a unicorn purse and some Guardian Angel coins in the hospital gift shop for her. The little girl sat up and never said a word, but her face lighted and she smiled, Loni recalled. Visit Codi Frazier’s Web site, sign the guest book and listen to her song “Codi Bug,” a unique composition by Michael Mugrage through Songs of Love, a nonprofit organization that creates personalized songs for chronically and terminally ill children and young adults. The America Cancer Society’s signature overnight event celebrates survivorship and raises money for research and programs. Teams gather at schools, fairgrounds, or parks and take turns walking or running laps. Dallas High School, 1250 SE Holman Ave.